Last week I attended a seminar at the National Library of Australia. Speaking on GriffithREVIEW 40: Women & Power, were Editor Julianne Shultz and contributors Chris Wallace (Canberra-based journalist) and Mary Delahunty (journalist, former ABC TV presenter and politician). Much of the dialogue centred on ‘unexpected tensions’ that have arisen in our country in the face of women acquiring power. Naturally, the focus was largely on Julia Gillard, our prime example of a woman in power. You can guess the sort of things that were discussed: Alan Jones’ comments on women destroying the joint, Tony Abbott goading Gillard into her now-famous misogyny speech, and words like ‘liar’ and ‘witch’ being spat out with an undeniably gendered venom. To me, though, the most interesting question posed by Griffith REVIEW 40: Women & Power and the subsequent seminar was ‘Does a women need to act as “one of the boys” in order to get ahead?’ Must she abandon the sisterhood and tread on the heads of other women to make it to the top? 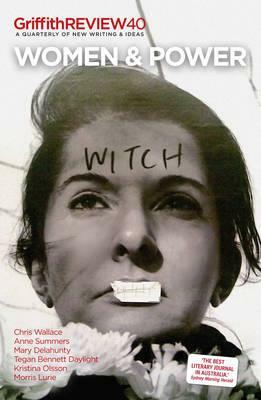 A couple of years ago, Chris Wallace was working on an unauthorised biography of Julia Gillard. For reasons that were never made public, the book was abandoned; not published. Many suspected that Wallace (who is married to Kim Beazley’s former chief of staff Michael Costello) bowed to pressure from ALP strategists, who feared the book would damage the Party. At the seminar, Wallace revealed that while she was working on the biography, she had begun to speculate as to why it was Gillard who rose to power within the ALP, rather than one of the other talented, prominent Labor women from the cohort, such as Nicola Roxon and Tania Plibersek. In short, Wallace indicated that during her climb to power, Gillard was not very supportive of her Labor sisters. She noted that while Roxon, Plibersek and others displayed a sort of comradely feminism, Gillard stood apart. She was all about the accumulation of power, says Wallace. Interestingly, Wallace assessed that only now is Gillard a good feminist, claiming that her experience as Australia’s first female PM has changed her – for the better. Having lived through the trials and tribulations that beset many women in positions of power, she now gets it, according to Wallace. Delahunty, meanwhile, defended Gillard on the one hand for her instrumental involvement in the establishment of Emily’s List—a lobby group successful in promoting progressive women into safe Labor seats throughout the country—while on the other hand likened her to Margaret Thatcher in her disregard for the advancement of her female peers. Thatcher didn’t help women, she said. In the end though, Delahunty conceded that for politicians, whether male or female, there is only one way to get to the top job — and that is to fight like hell and bugger everyone else. When she worked on ABC’s 7.30 Report, Delahunty said that if they were short of talent to interview, she would always try and fill the spot with a woman. Similarly, Wallace claimed that in her professional career, helping other women to achieve has been forefront in her mind. ‘Not all women are like that,’ though, she said. Turning the spotlight on the audience, Wallace then asked the largely-female group: ‘What are you doing to support female co-workers?’ It’s a good question. We know that in this country there are some great organisations out there promoting women, such as those that Rhi Leetham mentioned on HerCanberra just last week, like UBS Young Women’s Leadership Academy. But do we, as it is claimed Gillard and Thatcher did, adopt a dog-eat-dog mentality when it comes to our personal situation? Are we mindful of supporting other women in our work environment? Perhaps it is not until we rise to the top that we can start to haul others up from the pile of women below us.